Explore the historic towns of Norway’s Østfold region by Segway on this flexible-length trip. 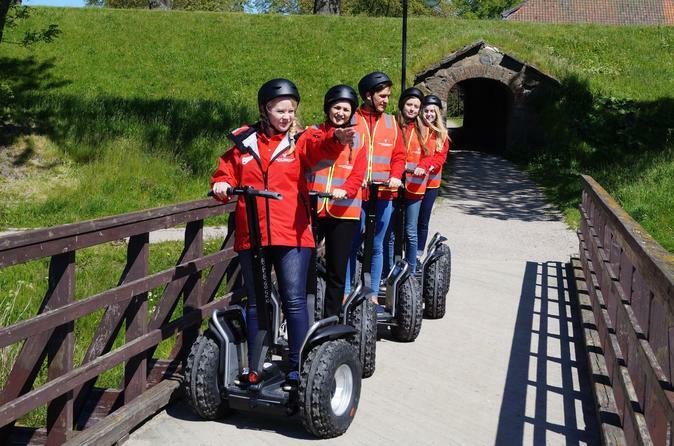 Step aboard an electric-powered scooter as you choose among a range of trips to sites like Sarpsborg, Moss, or Frederikstad, one of Scandinavia’s best-preserved fortress towns. A helmet is also included. Choose one of the three trips that best suits your schedule and interests, and then coordinate a time that fits your schedule. Your guide will be waiting with your Segway and helmet at the location of your choice. You might choose to visit the lovely parks and charming streets of Sporsborg, finishing with a lunch at Egon restaurant (own expense) at the town’s main square. Or check out the Old Town of Frederikstad, one of the best-preserved defensive sites in all of Scandinavia. Another option is a Segway trip to Moss or Halden. Whatever trip you pick, you’ll explore aboard an easy-to-handle electric-powered Segway, allowing you to rest your feet and cover more ground. At the end of your excursion you’ll return to your original starting point.